This contemporary 237 room resort, nestled in the historic capital city of Willemstad's Rif Fort area, offers the most exclusive shopping, dining, casino and nightlife on the island. Guests find relaxation amidst the resort's spacious 32,000 square-foot elevated private beach area. The resort's colorful ocean- and island-side guestrooms offer modern conveniences and feature spacious balconies with inspiring views. The resort combines the ambiance of authentic island charm with European sophistication. 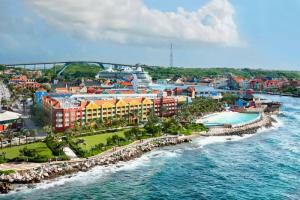 Located only 10 miles from the Curacao Airport, in the capital city of Willemstad.